Eggplant Parmesan + Roasted Red Pepper Sauce – Voila! 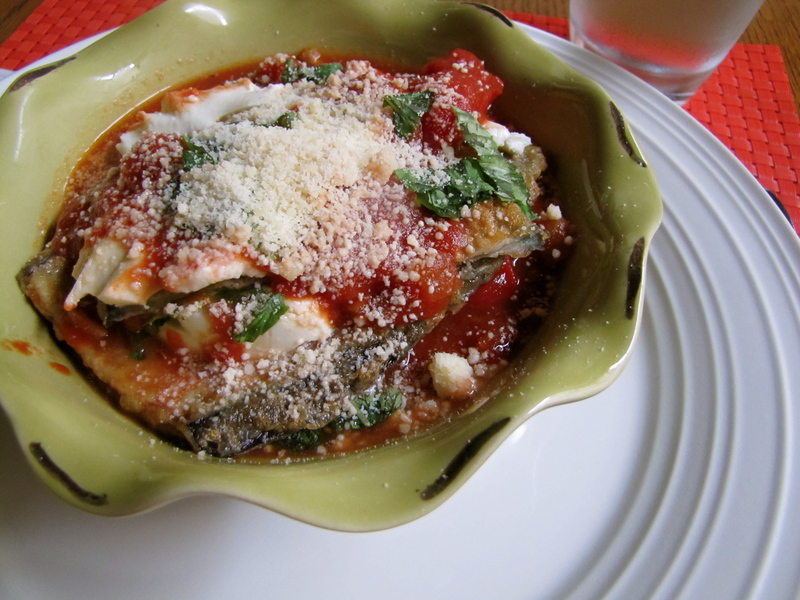 Eggplant parmesan is one of our favorite dishes. It’s hearty, savory, delicious, and as a perk, vegetarian! There are a million ways to make it but in the near future, I’ll be using this recipe. There are a few steps to prepare it, but it’s well worth the effort. This recipe can also be easily cut in half, served in small ramekins or other different sized dishes. Overall, you won’t be disappointed! 1. Sautee garlic over medium heat in a large saucepan until fragrant. Add onions and sautee together for another 3-4 minutes. 3. Add basil and let simmer for 30 minutes or more. 1. Cut eggplants lengthwise into 1/4 inch slices. Arrange one layer in the bottom of a large colander or baking sheet and sprinkle evenly with salt. Weigh down the slices with a couple of plates and let drain for 2 hours (or at least 20 minutes). The purpose of this step is to have the eggplant release some of its moisture before cooking. 2. When eggplant has drained, press down on it to remove excess water, wipe off the excess salt, and lay the slices out on paper towels to remove all the moisture. In a wide, shallow bowl, combine flour and breadcrumbs. Mix well. Pour beaten eggs into another wide shallow bowl. Place a large, deep skillet over medium heat, and pour in a a half inch of olive oil. 3. When oil is shimmering, dredge the eggplant slices first in the flour mixture, then in the beaten egg. Working in batches, slide coated eggplant into hot oil and fry until golden brown on both sides, turning once. Drain on paper towels. 4. Preheat the oven to 350°F. In the bottom of a 9×13 inch glass baking dish, spread 1 cup of tomato sauce. Top with one third of the eggplant slices. Top eggplant with half of the mozzarella slices. Sprinkle with one third of the Parmesan and half of the basil leaves. 5. Make a second layer of eggplant slices, topped by 1 cup of sauce, remaining mozzarella, half the remaining Parmesan, and all of the remaining basil. Add remaining eggplant, and top with the remaining tomato sauce and Parmesan. 6. Bake until cheese has melted and the top is slightly brown, about 30 minutes. Allow to rest at room temperature for about 10 minutes before serving.